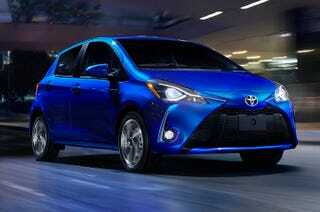 I thought I’d check up on the Yaris, and see if Toyota had given it a less awful powertrain by now. Surprise surprise, they haven’t. Still the same old 1.5 I4, and 4 speed auto, the finest technology that 1999 has to offer. Any others that still have a 4 speed? I can’t think of any off the top of my head, unless the 4L60E is still getting used in something.